An apology has 2 added components: admitting that the problem was your fault and finding out what you can do about it to appease your client. Mr. Owens says veterinarians often are much too eager to take blame before they determine whether something really is their fault. To broaden your search, Pursell advises, consider advertising in professional publications or at local veterinary medical or technical colleges and univer­sities, using employee referrals, or hiring a recruiter. WHEN PRACTICES SET STANDARDS and develop systems, they can really empower their team, says Tracy Dowdy, CVPM, managing director of MRG Consulting and founder of the Relationship Centered Practice Academy. 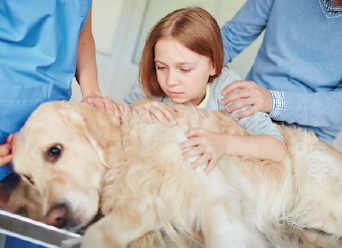 It starts with a mindset shift, she says, where practices see the advantages of sharing the knowledge wealth and the emotional wealth with the entire veterinary team. NANCY DEWITZ, DIRECTOR of sales and marketing and technical consultant for the marketing consulting firm Beyond Indigo Pets, suggests that practices imple­ment a care team for each exam: the veterinarian conducting the exam, the veterinary technician helping with the animal, and a third person inputting informa­tion directly into the practice management system. “This way, medical records are getting updated right away; billing happens right away, because it’s incor­porated into the practice management software; and the veterinarian is forced to verbalize what’s going on during the exam, which means the client has a much better understanding of what’s happening–and of the value you’re providing,” she says. CAITLIN DEWILDE, DVM, owner of the social media consulting firm The Social DVM, LLC, offers some dos and don’ts for building a professional online persona. First, make sure you’re using a professional page. “For sites like Facebook and Instagram, you want a business page,” she says. “That will give you a lot more access to Insights and analytics about when to post and who your clientele and followers are.” Facebook allows business users to schedule posts up to 6 months in advance.